Welcome to the LiveChat API documentation! Our API provides a set of flexible tools which you can use to create new outstanding projects. We smile a bit more each time we see skilled developers unleash their creativity! Please note that this documentation refers to the latest API version: 2.0. If you are looking for the previous version, check out the deprecated API 1.0 documentation. All LiveChat API requests start with https://api.livechatinc.com/. Please note that all LiveChat API requests must use `HTTPS` protocol. The next segment of the URL path depends on the type of your request. For example, use: https://api.livechatinc.com/agents to get or modify the agents data. All requests must have `X-API-VERSION` header set to the number of the version that you'd like to use. The most recent version is 2. LiveChat system operates in two data centers: dal and fra. The default data center is dal. All the LiveChat OAuth2.0 access tokens have a prefix: dal- or fra-. This prefix indicates the data center they belong to. If you need to specify the data center while making an API call, simply add the X-Region: <token_prefix> optional header. For example: if the user token starts with fra-, you should add X-Region: fra header. If the token starts with dal- you don’t have to specify the header. Two common authentication methods are supported: OAuth 2.0 and API key. OAuth 2.0 authentication is the recommended way of authenticating to LiveChat API. It is the most secure way of making API calls. With this flow, you will get access only to some parts of LiveChat account, such as reading agents list. This is more secure than API key flow which has always access to all LiveChat account data. To start using OAuth 2.0, please read a dedicated Authorization guide. If you want to build a private app that will run on your own server, you can skip the OAuth 2.0 flow and use the API key. Please note this flow of making API calls is less secure because the API key gives access to all LiveChat account data. With this authorization method, you will need to include your LiveChat login and API_KEY for each method call. You’ll find the API key in your LiveChat profile. Authentication to the API occurs via HTTP Basic Auth. Provide your login as the basic auth username and the API_KEY as the password. You must authenticate for all requests. All API requests must be made over HTTPS. The LiveChat API returns the data in the JSON format. Check out the following example. All requests made with HTTP GET are JSONP-enabled. To use JSONP, append callback= and the name of your callback function to the request. The errors are returned using the standard HTTP error code syntax. In general, the codes in the 2xx range indicate success, the codes in the 4xx range indicate an error (incorrect or missing parameters, not authenticated etc. ), and the codes in the 5xx range indicate an error with the LiveChat servers. Any additional info is included in the body of the return call, JSON-formatted. 400 – The request is incorrect, please make sure that the passed arguments are matching the format in the method’s documentation. 401 – Unauthorized. You attempt to authenticate with an invalid username or API key. 404 – Not Found. You attempt to request a resource which doesn’t exist. 500 – Internal Server Error. Something unexpected happened on our end. Please try again or contact our support. All cross-domain API requests made by a web browser are denied for security reasons. It means that the browser-based requests are not allowed from 3rd party domains (including localhost). PHP library for LiveChat API, hosted on Github. node.js library for LiveChat API, hosted on Github. Ruby library for LiveChat API, hosted on Github. C# library for LiveChat API, hosted on Github. R library for LiveChat API, hosted on Github. Did you write your own library and want it listed here? Let us know! Use this API method to manage your Agents and to get information about their activities. status - returns the agents with one of the following statuses: accepting chats, not accepting chats or offline. status can be: accepting chats, not accepting chats or offline. permission can take the following values: owner, administrator, normal. Returns complete details of the agent for the given LOGIN. Creates a new agent in your license. Updates the specified agent by setting the values of the parameters passed. Any parameters not provided will be left unchanged. Resets the API key for an agent with a given LOGIN. The return format is the same as in the update an agent method. Removes an agent. Archived chats will not be removed, but all statistics will be lost. The agent will be notified by e-mail that the account has been deleted. This method allows you to look up the past chats and after-hours messages. It also allows you to send chat transcripts via email. "user_agent": "Mozilla/5.0 (Macintosh; Intel Mac OS X 10_13_6) AppleWebKit/537.36 (KHTML, like Gecko) Chrome/68.0.3440.106 Safari/537.36"
The results are divided into pages, each containing 25 chats. To access next pages of the results, use ?page=<PAGE> parameter. Please note that first page’s number is 1, not 0. Note that the results are limited to the latest 100000 records on your LiveChat license, which gives you exactly 4000 pages with 25 chats per page. If you have more than 100000 chats on your license and you want to get them all, you will have to call our API several times. Returns a single chat item for the given CHAT_ID. The return format is the same as the single chat item in get list of chats. "result": "E-mail has been sent to john.doe@mycompany.com." This method updates the tags assigned to a chat. Use this method to get a full list of your Canned responses and to modify them. Returns the list of all currently set canned responses. CANNED_RESPONSE_ID is obtained from the list of all canned responses. Creates a new canned response. Updates the specified canned response by setting the values of the parameters passed. Any parameters not provided will be left unchanged. "result": "Canned response removed successfully"
Removes a canned response with the given CANNED_RESPONSE_ID. This method allows you to get information about your Goals and to modify them. Returns all currently set goals. The active parameter indicates whether a goal is enabled or not. Returns the goal details for the given GOAL_ID. custom_variable – with two additional parameters: custom_variable_name, custom_variable_value. url – with two additional parameters: url and match_type with possible values: substring (default), exact. api – with no additional parameters. "result": "goal marked as successful"
The GOAL_ID is obtained from the goals list. Optionally you can store additional information about the goal. They can be only retrieved using the API. custom_variable – with two additional parameters: custom_variable_name, custom_variable_value. Both are required. url – with two additional parameters: url (required) and match_type (optional) with possible values: substring (default), exact. The active parameter indicates whether the goal is active or not. Updates the specified goal by setting the values of the parameters passed. Any parameters not provided will be left unchanged. Removes a goal with the given GOAL_ID. You can use this method to create new and modify the existing Greetings. It can be also used to look up Greetings data. "greeting-message_text": "Hello, how may I help you?" Returns the list of all greetings. Use this function to create a new greeting. "greeting-message_text": "Hello, would you like to talk about our products?" Greeting rules are the conditions that must be met for a greeting to be displayed. The default value for operator is equals. The greeting will be sent when the specified variable is met. When using the `custom_variable` greeting rule, you also need to provide `variable_name` and `variable_value`. You also can add the optional `operator` parameter (defaults to `equals`). The visitors who have visited the specified sequence of pages will receive the greeting. When using the `url_funnel` greeting rule, you need to provide the `urls` variable. It is an array of objects with the required `url` parameter and the optional `operator` parameter (defaults to: `equals`). You can create a greeting that will have more than one rule. PUT -H X-API-Version:2 -d "..." "https://api.livechatinc.com/greetings/<GREETING_ID>"
You can change the previously created greetings using this request. The GREETING_ID is obtained from the list of all greetings. Use this request to change the name or message of a greeting. Activate or deactivate a greeting using this request. "greeting-message_text": "Hi, are you looking for some athletic shoes"
Change the rules of your greetings with this request. Use this method to get Agent Groups data and also to create new and modify the existing Groups. language specifies the chat window language for the particular group. agents list contains all members of the particular group. The group with id 0 doesn’t return the agents list because it always contains all agents from the license and it cannot be modified. Returns group details for the given GROUP_ID. accepting chats – when at least one agent from the group is logged in and has the accepting chats status. not accepting chats – when at least one agent from the group is logged in but has the not accepting chats status. offline – when all agents from the group are offline. Creates a new group in your license. Updates the specified group by setting the values of the parameters passed. Any parameters not provided will be left unchanged. Removes a group with the given GROUP_ID. This method allows you to access and extract all the Reports data available in LiveChat. Shows how many chats occurred during the specified period. This report shows you where you get your chats from. They can come from i.e. automatic invitations, manual invitations or the visitors can start the chats by themselves. Shows how many chats have been rated and how they have been rated during a specified period. Shows the ratio of good to bad ratings for each operator. Shows how many visitors waited in the queue and how many abandoned the queue or proceeded to chats. Shows the Minimum, Average and Maximum waiting time. Shows how long an agent (or a group or the whole account) was available for chatting during a specified period. When querying for one day, the results are shown in minutes per every hour, otherwise in hours for each day. Shows how much time an agent (or a group) spent on chatting during a specified period. When querying for one day, the results are shown in minutes per every hour, otherwise in hours for each day. The average amount of time it takes the agents to respond to a new chat over a specified period of time. count – the number of chat first responses during the specified period. seconds – the average first response time. The average amount of time it takes the agents to respond to a new message in a chat during a specified period. count – the number of chat responses during the specified period. This request shows the maximum number of concurrent chats that happened at the same hour on a particular day. Shows the number of reached goals and value of tracked sales. Returns the “greetings to chats to goals” conversion rates report. displayed is the number of displayed greetings. accepted tells you how many chats resulted from these greetings. goals tells you how many goals resulted from these greetings. Shows the number of the tickets created during the specified period. Shows the time of the first response to the tickets that were responded to for the first time during the specified period. count – the number of tickets that were responded to for the first time that day. hours – average first response time of the tickets. For example, "hours": 0.83 means an average first response time of 49mins 48sec. Shows the number of the tickets solved during the specified period. Shows the resolution time of the tickets that were solved during the specified period. hours – the average first response time of the tickets. For example, "hours": 0.83 means an average first response time of 49mins 48sec. Shows the distribution of the tickets between various channels. tickets_from_chat – the number of tickets created by the agents during a chat. Shows the tickets that were rated during the specified period. You can use this method to check whether your LiveChat is online or offline. Returns the current LiveChat status. Available return values: online, offline. Using this method, you will be able to create and delete Tags in LiveChat. You can also use it to learn more about the performance of all your Tags. Returns tags from all groups. Adds a new tag. Note that only the owner and the admins are authorized to use this. Deletes a tag from the chosen group. The agents will no longer be able to tag chats and tickets using this tag. Deleting a tag will not remove it from the archived chats and tickets. Use this method to get information about a specific case or all Ticket of them. You also use it to create new Tickets or update tags for the existing Tickets. The results are divided into pages, each containing 25 tickets. total indicates the total number of tickets. pages indicates the total number of pages. To access next pages of the results, use ?page=<PAGE> parameter. Please note that the first page’s number is 1, not 0. The return format is the same as the single ticket item in tickets list. Returns a single ticket item for the given TICKET_ID. The return format is the same as the single ticket item in [tickets list](#get-tickets). Updates tags associated with the ticket. You can use this method to get information about the real-time Visitors on your website. You can also use it to display additional information about the visitors in the LiveChat app. "title": "LiveChat Developers - REST API & Integrations"
Returns a list of the visitors on the pages with the tracking code installed. The possible state filter values are chatting and queued. prechat_survey parameter will be available only if the visitor is currently chatting. custom_variables parameter will be available only if the custom variables are defined in the tracking code. 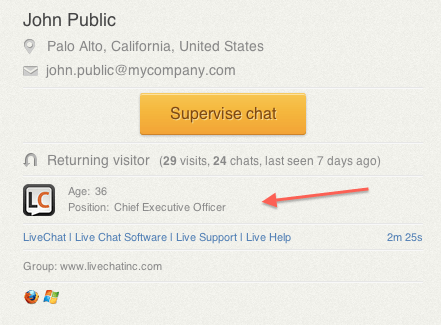 Displays additional information about a visitor in LiveChat apps. For example, if you have your own database with some additional details about your users, you can query this database based on your visitor’s e-mail address, and display the data from your database for an agent during the chat. Note: this method can only be used along with the Webhooks. You should create a webhook with chat_started event that will be sent to your integration script. This script must read webhook’s license_id and token params and include them in this API method call. See a sample integration in Webhooks documentation. fields array of data objects that include name and value properties. This is the actual data that you have about your visitor. This data will be displayed to the agent during the chat. For the links you can also pass the anchor text. By adding url param, the value field would act as the anchor. icon address of the icon picture that will be displayed in the LiveChat app next to visitor’s data. It lets you group important information. icon should be a URL without the http:// prefix. Your web server should support serving the icon file using https:// (SSL) protocol. The icon’s dimensions must be 64x64 px. This method will help you build your own LiveChat integrations by creating and managing webhooks. Check out our webhooks tutorial for more information, use cases and to learn how to get started. Returns a list of webhooks that have been created in a LiveChat account. Deletes a webhook with the given ID.